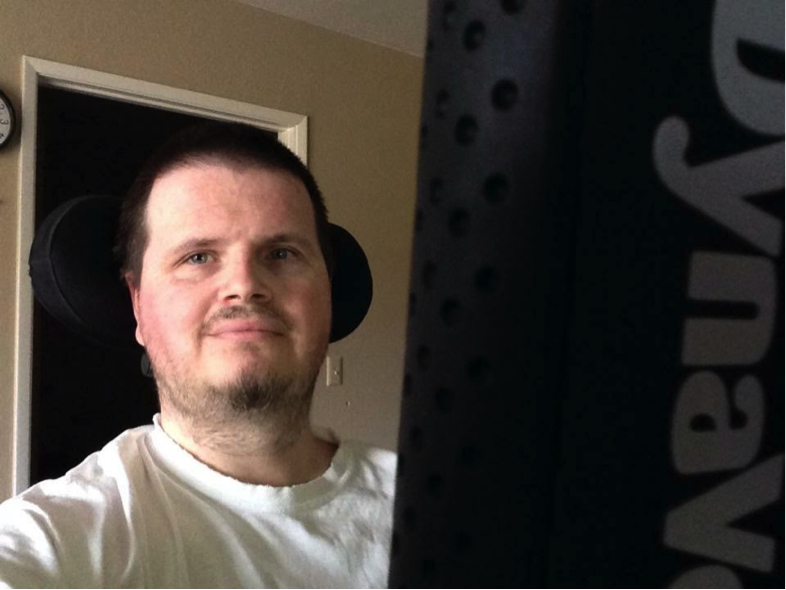 Brian (Dunric) is a former game developer and has been living with ALS since 1998. 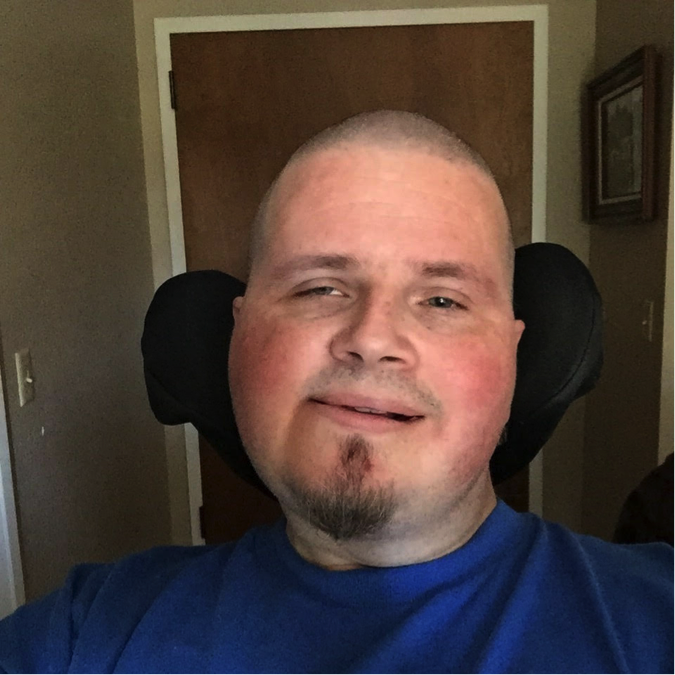 Unable to find a local ALS support group where he lives in Lodi, CA, he discovered PatientsLikeMe in 2012. I’m your average nerd who refuses to grow old, despite being 41 years old now. Diagnosed so many years ago and not having close family ties was rather trying on me. I’ve had my share of nursing home nightmares and some caregivers that made me feel like family. Some of kids I’ve known and helped raise over the years now have children of their own. It seems like the world changes but I do not. I try my best to make the most of each new day, and it feels the proper way to accept life with ALS. 2. In your profile you write, “Many trials and tribulations of ALS have pushed me to limits that I have never thought of before.” Can you describe some of these experiences, and how your life has changed since your diagnosis? I have gone through some situations that doctors never thought I’d survive but the worst of it all was accepting the fact that ALS would be part of my future. Not really knowing just what was going to happen or expect. It’s that uncertainty that can drive anyone absolutely mad. Having once the illusion of absolute control and then having that revealed to me that control is an illusion was a very hard thing to accept. There was a moment when I had my first PEG placed that the doctors (prefessionals as I call them) that I had informed them of feeling a “pop” sensation when PT wanted to have me sit up on the side of my hospital bed. Later that evening a licensed nurse had started a feeding session without checking patency. Hours later I had already had the beginning symptoms of Acute Peritonitis, all from the formula being introduced and me feeling a burning sensation. The following afternoon I was put into a CT scanner and shuttled up for emergency exploratory surgery. The surgeons never thought I would make it after a pulse of over 180 and my body in writhing pain. After several months I had recovered but had to have my tube surgically placed along with relocation of my stomach to prevent a recurrence of such a catastrophic disaster. 3. Your sense of humor shines through in many of your posts. What advice do you have for others on keeping a positive outlook? In my past I have had major anger issues and learned (on my own) how to channel and let go of such negative energy. I used to hop in my car and just go for a drive to unwind. Being no longer an option, the best way I have of releasing anger, fear, and such discomfort has been through humor or making light of some of the worst situations I’ve been in (in a tasteful manner of course). Such an example was during the long hospital stay I had was the wonderful view out my window of a cemetery. I asked my doctor “If I’m not going to make it, at least it’s a short trip next door don’t you think?” It was kind of a morbid view when recovering in your second month of madness. Best to make the most of it since it was all I had at the time. 4. What has your experience been like with PatientsLikeMe? What keeps you coming back to the site? Having no close family really makes ALS quite a challenge and I wanted to meet others in some way to compare notes, tips, tricks, and the occasional rant once in a while as ALS is such a trial on me to face alone. Having no car, nobody to help comfort my pain and frustrations. People here listen and I was surprised just how many lives I touched and look forward to reading my next update. 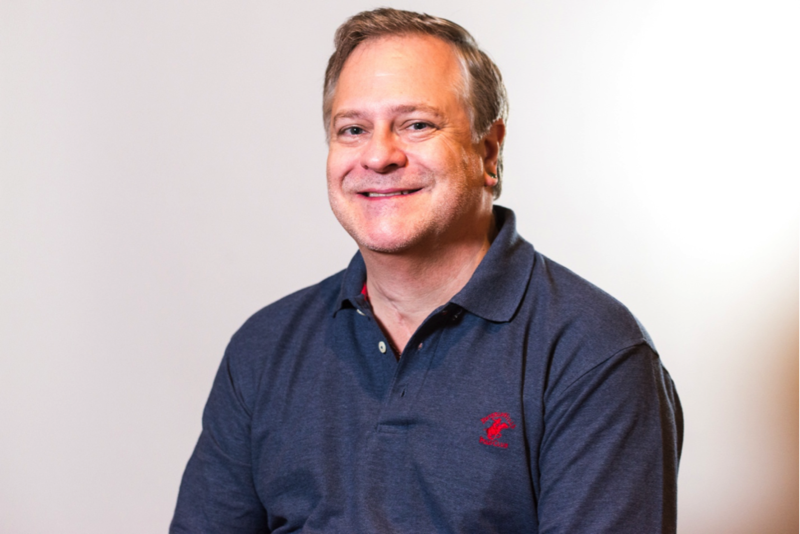 We recently sat down with Craig, one of your 2015-2016 PatientsLikeMe Team of Advisors. Craig is living with fibromyalgia and severe degenerative disc disease, the result of a serious car accident in 1978. Craig is active on PatientsLikeMe and other online communities, where he adds his voice to discussions about chronic pain, healthy living and LGBTQ issues. He’s also written essays to raise awareness about life with fibromyalgia, a “hidden disability” he feels is commonly misunderstood. In this interview, Craig shares how important it is to have a community he can turn to for support and to remind him he’s not alone. It’s a mixture of both smiles and sadness when I think of my greatest joys. I tragically lost my mother in a traffic accident when I was 19 years old. We had started a conversation the week before where I was trying to “come out” to her (that I was gay). I procrastinated and when she asked if I was, I said I wasn’t sure, that I was working on that answer, and that I’d tell her more next week. Well that conversation never happened, but each time in my adult life that I see or hear about a gay person sharing an important life moment with their mom, like introducing a new partner, or a mom marching with their child in a gay pride parade, I’m overwhelmed with happiness, and sadness, wishing MY mom was there with me to share those moments. Having a “hidden disability” is hard to live with. We worry about being judged because we outwardly seem “able-bodied”. But if a person could try to walk a mile, not even, walk a BLOCK in our shoes they’d understand what a hidden disability is. I wrote an essay about hidden disabilities entitled “Global Masked Hero Sightings Expected”. It discusses the phenomena that we all know too well — that people with disabilities are “INVISIBLE.” I liken it to having a “superpower,” albeit one that we don’t necessarily wish we had. Here’s a link to it on PLM. Imagine that you’ve just worked one of the hardest days of your life. You are so tired that you can hardly walk. Just changing your clothes is almost more effort than you can handle. Every muscle in your body is aching and tired, and the slightest movement of some of them sends them into a tight painful spasm. Your huge, warm, bed calls out to you seductively, and all you want to do is limp over and slip clumsily between the sheets and let the comfort of painless sleep welcome you. When finally sleep overcomes the pain you welcome it as the only comfort you’ve had all day. All too soon you wake up to a new day, and sitting up in bed, you realize that your body still feels as bad or worse than it did the day before — that each time you wake up you NEVER feel rested, or refreshed, and that this will likely go on for the rest of your life. Learn EVERYTHING you can about your condition! YOU should be the most knowledgeable person you know about what your condition involves. Research it. Google it. Read about Clinical Trials. Learn about the medications that might be used to treat your condition. Become a walking/rolling Wikipedia about your condition, then USE that information to make the best of living with that condition. When you know and understand almost everything about something, it holds NO power over you. When I was first realizing through first hand experience, the symptoms of my illness, before my diagnosis of Fibromyalgia, I felt overwhelmed and alone in the world. I didn’t understand how a condition could affect SO MANY different parts of my body and life. I could understand the mechanics of my neck and spinal damage, but I didn’t understand how it could manifest in so many different and distant ways. When I joined PLM and found that there were thousands of others with my condition I felt such RELIEF that I was not alone. I felt validated and somehow comforted that others knew what I was going through without being judged as lazy, or malingering, or attention seeking. I advocate for myself and for others on a daily basis. I’m active on PLM helping others understand more about their conditions. I write essays on many different social media, community, and news sites, helping the mundane world at large see the world through our eyes, and by seeing through our eyes, become better, more compassionate, more loving people. Can you think of any positive changes that have happened in your life because of your condition(s)? I believe there is a great balance in the universe for every person’s path in life. That for anything “taken away” by extreme loss or illness there is something “given” that re-balances your journey. There isn’t a year in my life that I would ask to do over again. I have learned SO MUCH from my walk through this world that has made me a better person. By seeing the world without the filters that life wants us to see through we are more able to see the world through the eyes of LOVE. It is BECAUSE of the adversity in my life that I grow closer to seeing the world with unconditional love. This ability to see the world without filters is the ability to see enlightenment. To transcend this earthly existence where we can become anything we desire or imagine.